Updike grows steadily more dazzling. After all, how many other contemporary novelists have had the artistic suppleness to launch two such different series of character-based books and allow them to do so much? (If Rabbit is a tennis-shoed archbishop of the American middle, Bech is Updike's pulchinello, his writer-as-sad-clown, a Mosaic itinerant.) Yet both characters feed off the same basic freedom: not failure exactly, but resonated disappointment. 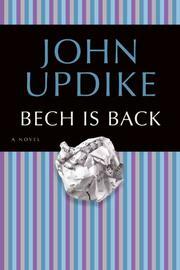 Henry Bech, you'll remember, is Updike's prototypical writer: New-York-Jewish, naturally--and a big splash that's now dried-out. (He's the winner of the Melville Award, "awarded every five years to that American author who has maintained the most meaningful silence.") So, stalled on his work-in-progress, Think Big, Bech scrambles. Signing limited-edition reprint pages of an earlier novel, each scrawl worth a buck-and-a-half and a free vacation in the Caribbean, he enters the nightmare of having his very name dismantle under his hand. When he travels on State Department tours to the Third World, his alkaline talks and the student demonstrations against him lead him to be "sorry he had ever said anything, on anything, ever. He had meddled with the mystery of creation. There was in the world a pain concerning which God has set an example of pure and absolute silence." He marries his WASP lover Bea, who gets him to move up to Westchester, to travel to Israel (where, to great comic effect, she's more enthusiastic than he is) and to Scotland (where Updike indulges in piquant travel-writing with sparkling economy). And they finally settle in, in Ossining-where the goyim terrify Bech as exotics, "so brittle and pale and complacently situated amid their pools and dogwoods and the old Dutch masonry of their retaining walls, that he felt like a spy among them and, when not a silent spy, a too-vigorous, curly-haired showoff." At last, then, Bech writes: he finishes Think Big (which seems wonderful/dreadful in Updike's clever outline), earns a bundle, winds up as just another celebrity . . . and ultimately abandons the let-down Bea. ("I just thought . . . your living here so long with me, with us, something nice would get into your book. But those people are so vicious, Henry. There's no love making them tick, just ego and greed. Is that how you see us? I mean us, people?") Schlemeil humor at its ventriloquistic best, fine travel observations, literary acid--all splendid. But Updike's newest Bech-book moves past the satiric pinpricks of the first volume and into a personification of moral compromise--sure to make any writer squirm in recognition, sure to reward any reader. Like a delicious sundae that turns out to be whipped up out of vitamins and minerals: brilliant fiction, great fun.